The Pet Loo is a portable indoor/outdoor toilet for dogs, cats, and other pets. Ideal for apartments, puppies, and occasions when you just can’t get home to let the dog out, the Pet Loo is a convenient alternative to pee pads and midnight bathroom breaks. 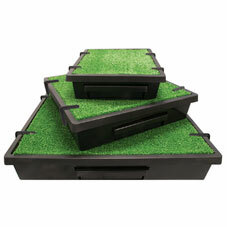 The top layer of synthetic grass allows urine to drain through it into the base. The base is slightly angled so urine trickles down into the waste container. The waste container catches the urine and is removable for easy cleanup. 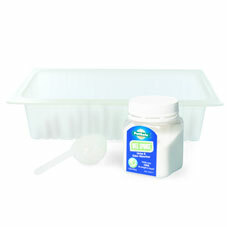 Enzyme cleaners for toilet training or removing stains. Pee Pods offer even better odor control. 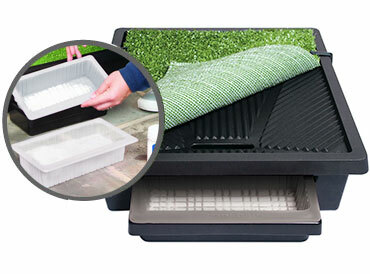 The Pee Pod with Wee Sponge powder fits in the waste container of the Pet Loo. The powder absorbs liquid on contact, turning into a solidified gel that traps odors. Simply throw out the pee pod every few days and replace it with a fresh pod and powder. Pets need to know where they can and can’t go. Most pets quickly learn to use the Pet Loo, but we also offer the Skip To My Loo spray for easy potty training. Wee Care natural enzymatic cleaners get rid of the stains and smells that cause pets to mark the same inappropriate spots over and over. I got my Pet Loo about 2 months ago and have had great results. It only took my dog about 3 weeks to get use to it completely. I put his pee pad on top of it first, and then I took it off as soon as I noticed him feel comfortable using it. He has not missed ever since. I thought it was going to smell because I have a small apartment, but it seriously keeps all the smells in the pan that you pull out to clean. I told my friends with dogs and they are all excited about getting one. It was a great buy! I just ordered this pet loo!!! My friend told me about it a few weeks ago. She just bought it for her dog "bellalulu's boyfriend" Stitch. She said her dog refused to go on the pee pads and would only go outside on the grass. Her dog loves it!!! It only took her about a week to get him trained on it. It took me about a year to get Bell's pee pad trained. I'm excited for it to arrive:0) As soon as she told me how easy it is to clean I had to buy one. I have 2 Italian Greyhounds and the female was trained in less than 2 weeks to use the pet loo. My male took about a week longer. Now they never go out in the cold, rain, sleet, or snow. They sleep with us and when they have to go potty in the middle of the night they jump out of bed, go potty on their pet loo, then come right back to bed. We have 2 pet loos and they work great best money I ever spent. Highly recommended. It really helps me when I am not at home and the dogs need to go. It's like having a mini backyard inside the house, very practical! 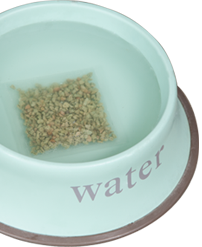 These pucks purify your dog’s drinking water to stop his urine from damaging your lawn. Degradable, environmentally-friendly poop bags allow for easy pick up.